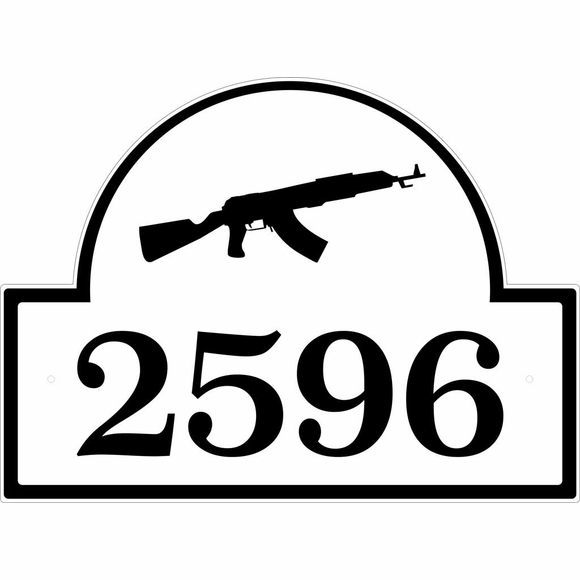 Weapon Theme Address Number Plaque - - 12" x 9" custom address sign features the gun or rifle logo you select above the street number. Holds up to four (4) 3" characters. Dimensions (approximate): 12"W x 9"H x 1/8". Click top link in Related Products to purchase a larger 16" x 11.75" version of this sign. Personalized Rifle or Pistol Address Plaque made in USA. For gun collectors, hunters, military families, and weapon enthusiasts.